Equity Fundraising is a crucial step for every startup. Yet, many entrepreneurs have a hard time navigating amongst the numerous and diverse actors of the field and struggle to find the right people to address. 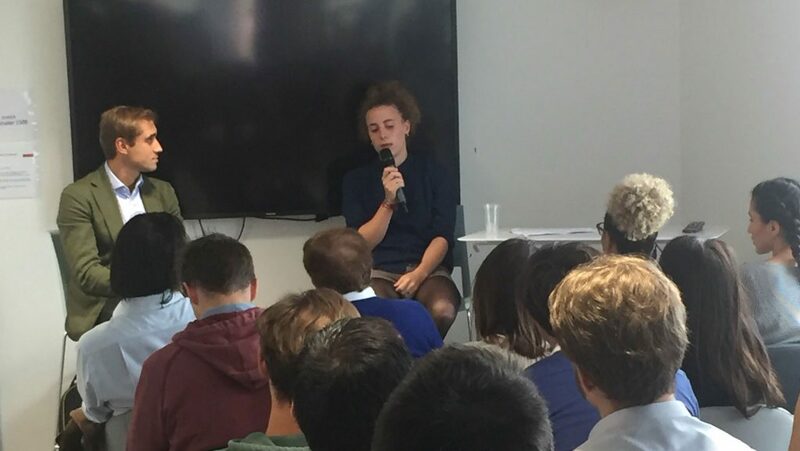 Nico Valenti Gatto, Principal at Partech Ventures and Violette Marquis, CMO at AngelSquare*, shared their knowledge on Equity Fundraising and talked about the similarities and differences between Business Angel and investment fund requirements. Nico Valenti Gatto (VC): Partech Ventures is a Venture Capital (VC) fund investing from pre-seed (€200,000 to €400,000) to growth (€10M to €45M) via seed (up to €1M) and ventures (up to €10M). We invest in Europe (2/3) and in the US (1/3) and are just starting to invest in South East Asia. We have offices in Paris, Berlin and San Francisco. We are generalist tech investors focusing on fin tech, marketing technology, e-commerce…. Their motivations are driven more by sentiment than ROI: in the past, they shared the same experience as the entrepreneurs and want a chance to give back. Nico Valenti Gatto (VC): The type of information required by the VC varies according to the stage: in later stages, they need to study more data as the business is more mature. As VCs do fund raising, they have a stronger investment capacity than BAs and hence, greater possibilities when it comes to investment. Partech Ventures for example manages €1.2 bn in assets split into 4 funds: pre-seed/seed/venture/growth. With specific investors at each stage, it enables us to intervene at different stages. Violette Marquis (BA): The team is the top criteria for BAs. More than the product and the market, a BA will look at the team’s capacity to bring a product to market, to execute the strategy… It’s almost like a weeding process. If a BA feels that there is any issue whatsoever amongst the team-members, this can be a breaking point. Before meeting a BA, make sure that you have clearly defined the mission of each person within the founding team. Regarding the product, BAs might want to feel some affinity with it or be able to understand it so that they can add more value. As for markets, it depends: some BAs favor niche markets, others large markets. What is very important is to target the BAs that you are approaching so that they can add value to your business. Nico Valenti Gatto (VC): VCs have 3 main investment criteria: the team, the market size and a disruptive product or market. Similar to BAs, it is crucial that the VC gets on well with the team as they are going to work together over the long term. Market size is another key investment criteria for VCs, but even more important is the Total Addressable Market. This has to also consider the evolution of the adressable market based on the disruptive element of the product or service e.g. taxi users and Uber. You should keep in mind that VCs often join the board. The more a VC invests, the more equity it has and the more involved and supportive it is with your company. Violette Marquis (BA): It’s very rare for a BA to become a board member. Nico Valenti Gatto (VC): Capital breakdown is another key investment criteria. VCs want to know who owns what. We want the founding team to be 100% involved in its business. Violette Marquis (BA): This is true for BAs too. A BA appreciates when the founders have a decent share of the capital and they frown upon sleeping investors. So, make sure that your capital breakdown is clean before you start to raise funds. Nico Valenti Gatto (VC): Investment strategies depend on the funds, some are specialized by sector but in general a VC will want to make a big exit. When we invest, we look for what we believe is the best opportunity in that market with the best team and the best performance at the right time. As a generalist VC, Partech Ventures diversifies its investments in different areas. For seed, we invest in artificial intelligence, robotics... anything that seems crazy as it is the nature of a seed fund to look for a domain not yet explored. For growth funds, on the contrary, we invest more in companies like made.com (furniture online) which is not as new but is more actual and consolidated, always in search for a very good team. So, investment strategies differ between early-stage and late-stage. This means that to perform well as a fund, we need to have a macro vision of our portfolio. Data room: which documents do you need for face-to-face meetings with potential investors? The more a BA invests in your company, the more demanding he/she gets in terms of the requested documents. Make sure that you know your key metrics! Violette Marquis (BA): A data room takes time but it is a good exercise in being well prepared. Remember that the pitch deck is the first impression you will give to your potential investors. Violette Marquis (BA): If a BA likes your pitch deck and asks to meet with you, always say yes, even if it is at 9 pm on a Saturday evening. Make sure that you always stay on guard, even if you meet your potential investor over a relaxed meal on a terrace! It’s not because it is relaxed that you must not remain serious! The due diligence is much shorter with BAs than with VCs. BAs don’t like to multiply the number of meetings and know very well how precious your time is! Another important thing: know how to say no. When the pitch deck has been well received, you get a first contact with an analyst via a call or a meeting. So here, it is essential to capture his/her attention and stand out from all other calls shwoing that you know your business and market inside out. After this required first screening, the analyst will ask you for a second call or meeting, this time with the partners. A face-to-face meeting is then organized with all the senior partners for the final decision. The entire process can take between 2 weeks and 1.5 months. Violette Marquis (BA): Keep in mind that the human relationship with your potential investor is key. You need to be able to work well together and to share the same vision. Violette Marquis (BA): BAs request little information after the fundraising stage, at most a quarterly report. But don’t hesitate to mention any important changes. A BA doesn’t want to be too involved in your day-to-day business but he/she will be happy to provide occasional help for specific missions. Nico Valenti Gatto (VC): It is quite different with VCs as the more a VC invests in your company, the more involved it gets! They attend the board meetings. If the startup is good enough, it will be able to choose its VCs and it can decide which VC can bring the best support to the table and this is called the smart money: network, expertise in recruitment, accountancy, finance… Bringing the cash is just the beginning for a VC which will bring its support to the company in the long term to ensure the company's growth. It’s a long-term relationship, therefore regular reporting is key. The VC has a more structuring role than the BA. After the fundraising stage, a VC must be capable of facilitating your operations. Q/ What about getting some help from a lever? It’s expensive but it can save you time! It makes sense to help you prepare the documents required for fundraising, to grow your network… If the lever comes to your meetings with the BA or VC, make sure he/she remains discrete and doesn’t talk more than you! Q / What is the best timing to raise funds at the pre-seed stage? Even though it seems obvious to do this when you run out of cash, you should anticipate and do it earlier. Good timing is when you have signed a big contract and you feel that you have momentum! This means that you are in a strong position to attract funds. A good sign is when you feel that there is an interest for your business. The longer you can successfully manage your business without raising funds, the stronger the position you will be in if you need funds. Q/ How do you identify funds by sector? Your best option is to read the specialized press. Don’t send an email to every fund but opt for a more focused approach. Try to find the right contact for you. Q / Is debt financing a negative point for you? Not at all. On the contrary, it shows that you can find cash by any means. * AngelSquare is the leading French angel community bringing together the best French angel investors (+500 investors, with an average participation of €60k). AngelSquare boasts more than 80 done deals in Seed and Serie A stages.